Condo, 2 bedroom plus bunk area. Without question this unit is the best location at Beach Retreat. This top floor (4th) is located directly in front of the beach access. The unit provides unobstructed views of the Gulf of Mexico and is very quiet. Two bedroom with Bunk area and pull out sofa. The Master faces the beautiful Gulf of Mexico as well as the main living area. It will comfortably sleep 8 for that large family vacation. Black out draperies ensure a cozy late morning or an afternoon nap while falling asleep to the sound of the surf. On your private balcony you'll be able to read, sunbathe, listen to the gentle waves, take in the views, or enjoy a cup of coffee and the morning views while watching the dolphins just off shore. At the end of the day you'll wind down to breath-taking views of the sunset. Clean, cute and great location! Great stay! I’d recommend this place to any beach lover! Clean, well stocked kitchen, beautiful view. Nice pool and walking distance to several restaurants. Just got back last week from this wonderful condo; it was everything it was advertised to be and then some! 3 large King suites with accompanying bathrooms and all the amenities of home. The pictures on the internet do not do the place justice as I and everybody in my family were blown away by the ideal setting and the Million Dollar view from the ample balcony! Perfectly located and central to almost everything you would want to do while in Destin; right down the street from the huge outlet mall Ladies! I and all of my family would recommend this Condo for your perfect vacation spot while in Destin, you will not be disappointed. The pet friendly attitude was a huge plus, as I love to travel with my Shitzu who is now 16 years old and cannot be left with anyone else as he is my shadow. My family has rented this particular condo for the last two years through Becki Downs and VRBO. The condo is very nice, well maintained, well decorated, has great amenities throughout the unit. It is very spacious and great for bringing your family on vacation. The three bedrooms make it perfect for everyone to be together yet have their own space. All three bedrooms come with king size beds and their own bathrooms. The view from the balcony is priceless and the white beaches are breath taking. You get spoiled with the tranquility of this unit and the beauty of the beach. 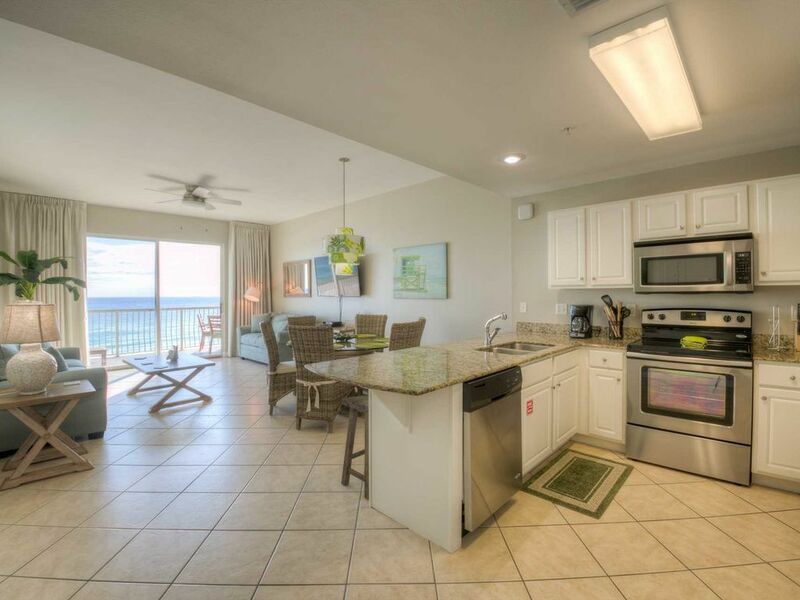 The location of the condo is very convenient to everything yet away from the crowds of the hotel area of Destin. Our entire family would highly recommend renting this awesome unit!!! Pompano Joes just down the road is a must for great food, drinks and music. There are plenty of things to do here but most of all enjoy the beach and the time with your family. Memories are forever and our vacations to Destin have made some great lifetime memories for all of us. Becki was a tremendous help in our vacation planning and booking of this unit. We look forward to renting this unit again next year and the countdown has already started for next summer. This spacious unit was tastefully decorated and very clean. There were plenty of towels and the kitchen was well stocked with appliances. The views were spectacular from the balcony which was huge. It was convenient to everything and the beach was right across the street. It was a bonus to have two chairs and an umbrella waiting for you everyday. We brought our two dogs since it is pet friendly and they felt right at home. My family an I enjoyed our stay at Destin and look forward to it next year. Condo is in a great location, convenient to almost everything we do in the area. View from the balcony is priceless. Kitchen is well equiped and the unit is very nicely (and currently) decorated. It was also perfectly clean. The bed in the master was very comfortable. This is usually our biggest gripe about other places we have visited. The beach is only a few steps away, white powder sand - perfect. Parking and access to the unit was a breeze. Although we only used one, all 3 bedrooms are large with king beds. We were very pleased. Tropical Storm Lee gave us a couple of really rainy/windy days. Can't blame that on the condo, so my wife blamed me. After it blew through, everything was beautiful.